You can smell the heavy perfume from these soap bars straight off the bat, and each of them are gorgeous. My favourite of the two is the Green Tea scent that has a hint of zest within the tea. It's like a refreshing, spring summer hug in a bar of soap and I love it. The Honey and Camomile bar is milkier and more floral. The bar itself is a nice size; easy to hold but also more than enough to last a long time. 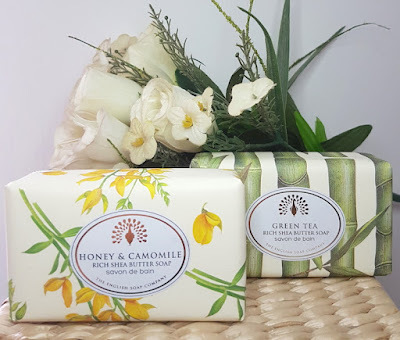 When it comes to using it, it lathers up easily on the skin, so you won't be there for a long time trying to reach a lather that's enough to wash properly. 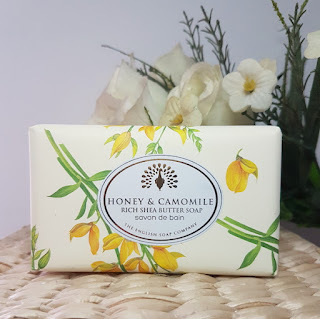 As you massage it into the skin you can also feel that it is buttery and smooth and as you rinse it away the skin feels clean but not dried out. 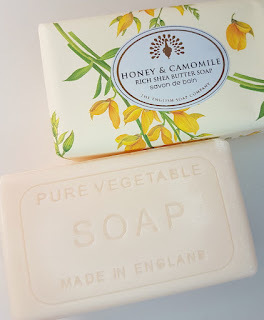 Some bar soaps can be quite drying on the skin, but I found that these did a great job at preventing that by giving a nice boost of hydration too. You will need to follow it up with a body lotion, yes, but you can be reassured that they're not stripping the skin of oils in the first place. In regards to the scent, I find that it lingers on the skin for a while, but it will be dulled with the use of a body lotion. It lasts for some time in the bathroom itself though which is lovely, so you can come back a short while later and still smell it. Overall, I really love these soaps. They are so luxurious and beautifully scented, as well as gorgeously wrapped. These would sit well in any bathroom and they would also be great gifts. I could particularly imagine fragrance fans being fans of these also (saying that as a huge fan of fragrance myself). 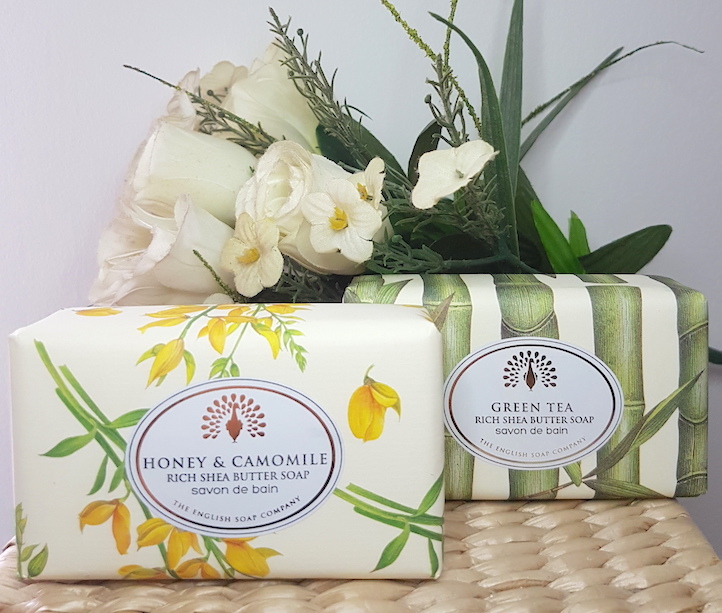 If you're not particularly swayed by the sound of the Green Tea or Honey and Camomile varieties, definitely do check out the rest of their range. Everyone is bound to find a scent that they love the sound of and packaging to match the colours and style of their bathroom. As an extra sneaky tip, you can also open the soaps gently on one end and tip it so that the bar slides out. 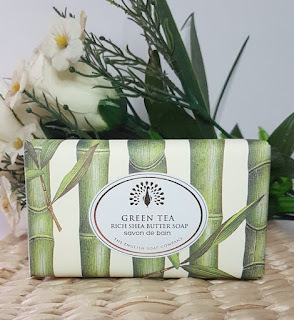 This means that you can then keep the packaging within the shape of the bar if you really love it and keep it in your bathroom for decorative purposes (the paper is just too pretty, okay?!). 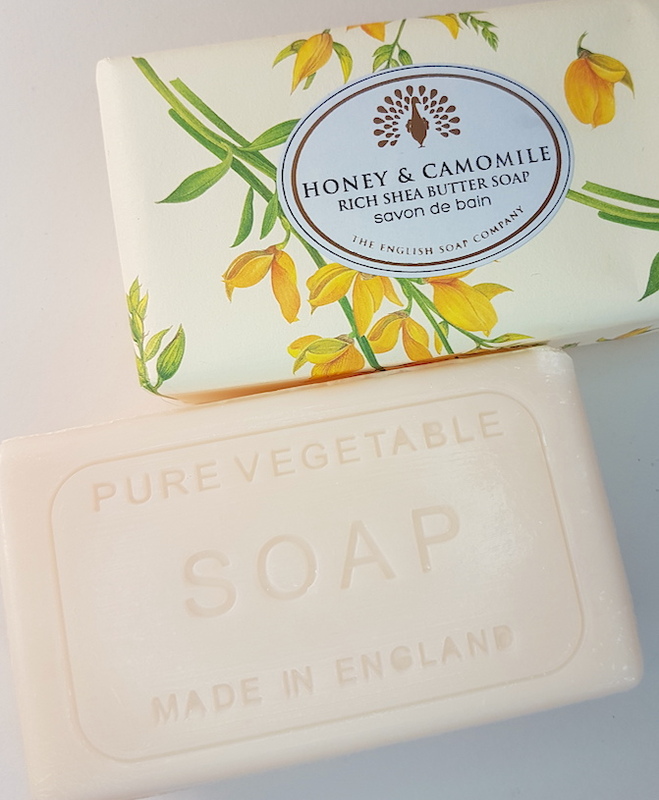 You can purchase the soaps from The English Soap Company. What are your thoughts on these vintage wrapped soaps? Which scent takes your fancy?